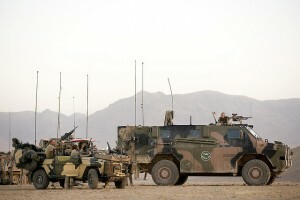 Thales Australia’s Bushmaster has received fresh export orders from Japan and Indonesia, with strong interest expressed by Libya, making the Aussie-made Protected Mobility Vehicle (PMV) a rising star in the defence market. According to a feature on The Telegraph, a total of 1045 units have been built at Thales’s factory at Bendigo in Victoria, which has 240 workers. Another 55 Bushmasters are set to come off the line by the end of 2015. Sources say Japan has ordered 10 vehicles while Indonesia will take an initial order of three. Libya has expressed interest in between 100 and 400 of the 15-tonne armoured troop carrier. Last week Thales Australia announced that it has signed a contract to supply 12 Bushmaster vehicles to the Jamaica Defence Force. A five-year support package is also included in the contract to ensure the highest levels of availability and performance. Thales Australia CEO Chris Jenkins said the Jamaican Defence Force has been eyeing the Bushmaster for some time now and the company is now pleased to add them as an export customer. “The Bushmasters are ideally suited for both internal security and humanitarian operations. The inclusion of the support package demonstrates the customer’s trust in us to deliver and maintain an effective capability over several years,” Mr Jenkins said in a press release. In the span of its service in Afghanistan, no soldier has been reported killed while riding the Bushmaster. Its success can be attributed to the heavily armoured V-shaped hull that directs blast away from its occupants. A single Bushmaster costs in excess of $500,000. According to the Telegraph report it can transport 10 troops, and can itself be transported in a C-130 Hercules aircraft. The vehicle is powered by a Caterpillar 224 kW turbo diesel engine with a range of more than 800km.